Christ is the One and only Servant Who in His human nature was perfectly obedient and pleasing to God. For Christ is pleasing to the Father not only as Son and God, but also as Man. He is the only Sinless One Who carried out all the counsels and commandments of the Father and fulfilled all righteousness, and in this sense is said to serve God the Father. He alone can be called the true Servant of God. 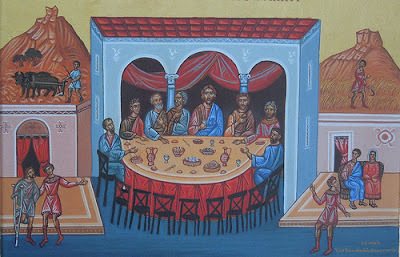 He was sent at supper time, that is, at the appointed and proper time. For there was no other time more opportune for our salvation than the reign of Caesar Augustus, when iniquity had reached its peak and it was critical that it be cleansed. Just as physicians allow a festering and malignant boil to burst and release all its foul pus, and only then apply the medication, so too it was necessary that sin first display all its forms, and then the Great Physician applied His medicine. For this very reason the Lord waited for the devil to fill the full measure of iniquity, and then the Son of God took flesh and healed every form of iniquity by every aspect of His holy life. Therefore He was sent at that hour, that is, at that comely and opportune season of which David says, "Gird Thy sword upon Thy thigh, 0 Mighty One, in Thy comeliness." (2) Certainly the sword here signifies the Word of God [Heb. 4:12], while the words "upon Thy thigh" indicate His Nativity in the flesh which was in comeliness, that is, when the time was right and seemly. He was sent to speak to those who had been called. Who are those that were called? Perhaps this refers to all men. For God has called all to the knowledge of Him, by means of the order and harmony of visible creation, and by means of the natural law. But those that were called are also, more specifically, the children of Israel, who were called through the law and the prophets. In the first place, then, the Lord was sent to the sheep of the house of Israel. [Mt. 15:24] The Lord was saying to all the Jews, "Come, for all things are now ready, when He proclaimed the good tidings that the kingdom of heaven is at hand" [Mt. 4:17], and "among you" [Lk. 17:21]. "And they all with one accord began to make excuse," that is, as if at a signal. For all the leaders of the Jews refused to have Jesus as their King, and thus were found unworthy of the supper, one because of his love of wealth, and another because of his love of pleasure. The man who bought a piece of ground and the man who bought the five yoke of oxen signify those who love wealth, while the man who married a wife signifies those who love pleasure. Furthermore, the man who bought a piece of ground signifies the man who cannot accept the mystery of faith because he is governed by the wisdom of this world. The piece of ground represents the world and, in general, nature, and the man who must go and see his piece of ground is he who sees only nature, and cannot accept what is beyond nature. Therefore the Pharisee, for example, "sees his piece of ground," that is, he looks only at the laws of nature and cannot accept that a Virgin gave birth to God, because that is beyond nature. Because they are examining this "piece of ground," that is, nature, none of those who boast in external wisdom have recognized Jesus Who made nature new. The man who bought five yoke of oxen, and tested them, also represents a man who loves the material world. He has yoked the five senses of the soul to the five senses of the body and has made the soul into flesh. For this reason he is concerned only with the earth and does not desire to commune of the rational Supper, for as Wisdom says, "How can he get wisdom that holdeth the plough?" [Eccles. (Wis. of Sirach) 38:25] He who stays behind because of a wife is a lover of pleasure who has devoted himself to the flesh, the mate of the soul. By cleaving to the flesh he cannot please God. You may also understand these things literally. We also fall away from God because of fields, because of yokes of oxen, because of marriages, when we become so attached to them that they consume our whole life and we are carried away even to the point of shedding blood over them. Then there is no divine thought or word that we can practice, or even comprehend. 21-24. So that servant came, and declared to his lord these things. Then the master of the house being angry said to his servant, 'Go out quickly into the streets and lanes of the city, and bring in hither the poor, and the maimed, and the halt, and the blind.' And the servant said, 'Lord, it is done as thou hast commanded, and yet there is room.' And the lord said unto the servant, 'Go out into the highways and hedges, and compel them to come in, that my house may be filled. For I say unto you, that none of those men which were called shall taste of my supper.'" The rulers of the Jews were rejected, and not one of them believed in Christ. And they even boasted of their malice, saying, "Have any of the rulers believed on Him?" [Jn. 7:48] Therefore these students of the law and scribes, as the prophet says, became foolish and fell from grace. But the simple from among the Jews are likened to the halt, the blind, and the maimed. It is the foolish of this world, the lowly, who were called. For the multitude marvelled at the words of grace which proceeded from the mouth of Jesus, and they rejoiced in His teaching. But after these had come to Him from the sons of Israel, that is, from the chosen whom God foreordained for His glory, such as Peter, and the sons of Zebedee, and the tens of thousands of those Jews who believed, then God's goodness was poured out also upon the Gentiles. For those who are in the highways and hedges mean the Gentiles. The Israelites were within the city, inasmuch as they had received the lawgiving and inherited a civil and moral way of life. But the Gentiles were strangers to the Covenants, and the lawgiving of Christ was foreign to them. They were not fellow citizens of the saints, and did not travel the one true path, but instead followed many highways of lawlessness and coarseness, and were to be found in the hedges, that is, in sins. For sin is a great hedge and middle wall which separates us from God. By "highways" He signifies the Gentiles' coarse way of life, which led them to so many false beliefs. By "hedges" He signifies their life of sins. The master does not command his servant simply to call all those in the highways and hedges, but to compel them to come in, although each man is free whether to believe or not. But He uses the word "compel" to teach us that it is a sign of God's great power that the Gentiles, who were in such ignorance, came to believe. If the power of the preaching and the might of the word of truth had not been so great, how could men who were crazed with idol worship and practiced unspeakable things have been persuaded all at once to know the true God, and to perfect a spiritual life? He called this "compulsion" to show the miraculousness of their change. One might say that the pagan Greeks did not want to leave their idols and their rich feasting, yet they were compelled to flee from them by the truth of the Gospel. Also, the power of the miracles He worked was a strong force that induced them to be converted to faith in Christ. Every day this Supper is prepared and we are all invited to the kingdom which God prepared for man even before the foundation of the world. But we are not worthy of this Supper—some of us because of useless philosophical musings, others because of love of material things, and yet others because of pleasures of the flesh. But God in His love for man freely bestows this kingdom upon other sinners, upon the blind who have no spiritual vision to perceive the will of God; or if they can perceive it, upon those who are crippled and unable to take a step to do the will of God. And in short He grants the kingdom of heaven to all the poor who have fallen away from the glory above, and even to the maimed who cannot show forth in themselves a blameless life. To invite these sinners to the Supper, who are wandering astray in the streets and broad avenues of sin, the Father sends His Son Who became a Servant according to the flesh, and Who came not to call the righteous, but sinners. All these He feasts liberally, instead of the clever, the rich, and those who indulge the flesh. By the judgments known to Him alone He sends diseases and dangers upon many, causing them, even against their will, to renounce this life. Thus He leads them to His Supper, "compelling" them by means of the dangers. There are many examples of this. Understood in a simpler way, this parable also teaches us to show favor to the poor and the crippled rather than to the rich, just as He exhorted us to do a short while before. [Lk. 14:13-14] It is for this reason that He tells this parable, to confirm that we must give hospitality to the poor. And we may also learn from this that we should be so eager and generous in welcoming our brethren that, even when they are reluctant, we should compel them to partake of our good things. This is also good advice for teachers: teach what is necessary, even when the students are unwilling. 1. The definite article is present in the Greek text, ton doulon autou [the servant of him], but not in the English translation, "his servant," because in English the possessive pronoun coming before the noun replaces any articles. 2. Ps. 44:3. The Greek word oraiotetos, rendered here as "comeliness," derives from the adjective oraios, which in turn derives from the noun ora, which means "hour." This Greek word for "beautiful," oraios, has a broad range of meanings including, "coming at the right season [ora], seasonable, timely, ripe, at the bloom of youth, beautiful."